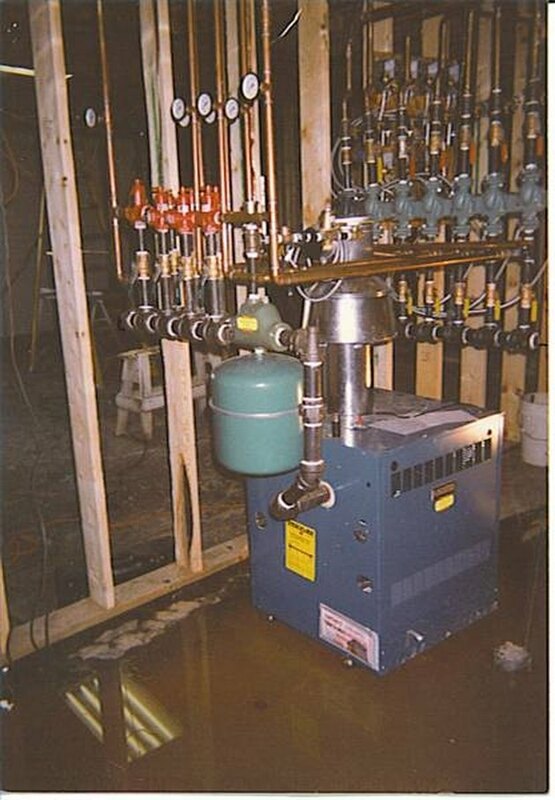 To understand the workings of an oil-fired boiler, it is helpful to look at it in one of its most common applications: as a heating system found in many homes and businesses. Consider a common scenario that occurs many times a day. People within a building set the thermostat to a temperature at which they will feel comfortable. When the room temperature drops below that setting, the thermostat sends an electrical signal that opens a valve and releases hot water from the boiler. This water enters distribution piping and passes through heating baseboards or radiators that warm the air by both radiation and air convection. A pump is used to circulate the water through the piping and then back to the heating boiler. The water has cooled during its journey and, upon mixing with the water already in the boiler, will cause a drop in temperature. A temperature sensor in the boiler water is connected to the main control of the boiler. When the temperature of the water drops below a predetermined setting, an electrical current is sent to the oil burner and switches it on. The oil burner then pumps oil at high pressure from a holding tank through a fuel line to a burner nozzle. The nozzle sprays the oil into a fire chamber, separating it into small droplets so that it will vaporize quickly and thus be susceptible to combustion. The oil burner has both a high voltage ignition system that sends sparks and an air intake blower that provides air into the fire chamber. This provides all that is necessary to efficiently ignite the oil vapor. Hot gases from the burning oil pass through metal tubes or sections in the boiler, heating them in the process. These hot pipes in turn heat the water in the boiler up to the safe maximum temperature of the system. This water is stored in the boiler until the system is put into action again by the thermostat in the building. How Is an Air Handler Different From a Furnace?